Light pollution increases the brightness of the night sky close to the urban areas. The effects of these excesive illumination are noticed at great distances. We are researching on the effects of light pollution on the night sky brightnes (in magnitudes per square arcsec) using the tools of the astronomers with photometers and all sky cameras. With automatic systems on board of vehicles we are also mapping the night sky brightness around Madrid. We are working on the effects of light pollution in the Universidad Complutense de Madrid on the UCM astronomical observatory (Observatorio UCM) that is an urban observatory located in Moncloa campus (Ciudad Universitaria). Astronomiacl observations are affected by Madrid light pollution. With the help of amateur astronomers belonging to the Asociación de Astrónomos Aficionados de la Universidad Complutense de Madrid (ASAAF-UCM) we are drawing maps of the illumination of the campus to inform of its effects and reduce its impact by promoting a more efficient public lighting. This Astronomical monitor is an all sky CCD camera that determines the extinction coefficients in the Johnson B, V and R photometric bands. AstMon-UCM also maps the night sky brightness of the visible sky. The collected data are useful to establish the quality of the sky and the evolution of its brightness due to the effects of Light Pollution in Madrid. 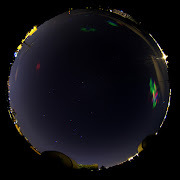 Browse AstMon-UCM on line images of the Madrid night sky over the Physics building of Universidad Complutense de Madrid. The NIXNOX project, sponsored by SEA the Spanish Astronomical Society, is a Pro-Am collaboration with the aim of finding sites with dark skies. All sky data of the night sky brightness is being obtained by amateur astronomers with Sky Quality Meter (SQM) photometers. We are not looking for remote locations because the places should be easily accessible by people with children. The main objective of NIXNOX is to motivate citizens to observe the night sky. NIXNOX will provide information to answer the question: where can I go to observe the stars with my family? NSB network of monitor stations using SQM photometers.